@ Flamingo Theater at The Four Ambassadors Building in Miami. 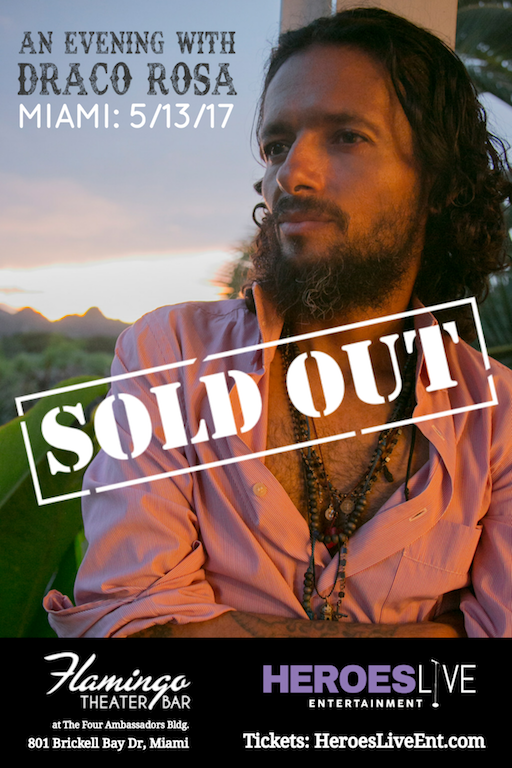 An Evening With Draco Rosa showcases a softer side of the multiple-time GRAMMY and Latin GRAMMY winning musician’s repertoire. The intimate tour will unveil new tracks from his forthcoming project. Draco Rosa, aka Robi Draco Rosa, or simply Draco, is a multiple-time Grammy and Latin Grammy winning American-born Puerto Rican musician, singer, songwriter, composer, multi-instrumentalist, dancer, record producer and entrepreneur. Born in Long Island, NY, Draco was raised surrounded by an eclectic mélange of musical tastes: from his mother’s affinity to the rock of the Beatles, Led Zeppelin, the Who and the funk-ridden R&B of the seventies, to his father’s propensity toward salsa—not just any salsa, but, as Rosa puts it, “the dark, aggressive kind.” At a young age, his family moved him to Puerto Rico, where he became a member of the increasingly popular band Menudo in the 1980s. After leaving the band he moved to Brazil where he released two albums, achieving mainstream success. Afterwards he moved to California and formed the band Maggie’s Dream, which split after only one album, allowing him to resume his solo career. The singer and composer has released several studio and experimental albums, and has composed/produced multiple songs for major artists. In 1996 he released the critically acclaimed Latin alternative rock album Vagabundo produced by Phil Manzanera, just before helping launch Ricky Martin’s musical career into a new global setting with the album “Vuelve”. Rosa wrote and produced various of Martin’s hit singles including “Maria”, “Living La Vida Loca”, “La Copa De La Vida”, “She Bangs”, among many others. In April 2011, Rosa was diagnosed with non-hodgkins lymphoma. This kept Rosa in a hiatus for a few years until his return in March 2012, when he started recording his award winning album “Vida” along side artists such as Juan Luis Guerra, Rubén Blades, Enrique Bunbury among others. In December 2012, he was declared cancer-free. After a very successful “Vida” tour in 2013, on December 9, 2013, his cancer had relapsed and was later overcome, becoming cancer free once again after a second (alogenic) bone marrow transplant. Taking some time off to ground himself in his native Puerto Rico, Draco took advantage of this new awakening to write “El Secreto de La Vida A Base de Plantas” , with friend and renown nutritionist Nina Niessen. The book became an Amazon.com Top Seller in 2015, and a must read in Alternative Medicine literature. Also, Phantom Vox, his legendary recording studio, was relocated from Los Angeles to his 100 acre estate in Puerto Rico, ‘Hacienda Horizonte’, where his coffee brand “Café Horizonte” became a premium export brand, acknowledged among national and international coffee growers. In recent months, Draco created a new local coffee brand in Puerto Rico called “Draco Rosa 100% Cafe de Puerto Rico” which directly impacts the local economy by increasing employment on the island and contributing to the growth of local coffee farming. He also created the Vox Forte Alliance, a foundation that strives to educate, create awareness and give support to stem cell transplant patients. He also sponsors the island’s Museo de Arte, Museo de Arte Contemporáneo, and set up an annual scholarship for outstanding students at Puerto Rico’s Music Conservatory. 801 Brickell Bay Drive, The Four Ambassadors Bldg.